Tamiya's new 1/48th scale tank series has not caught on as well as Tamiya expected, but I still find 1/48 to be a nice compromise between the detail level of 1/35th scale armor and the speed and fun of smaller scales. 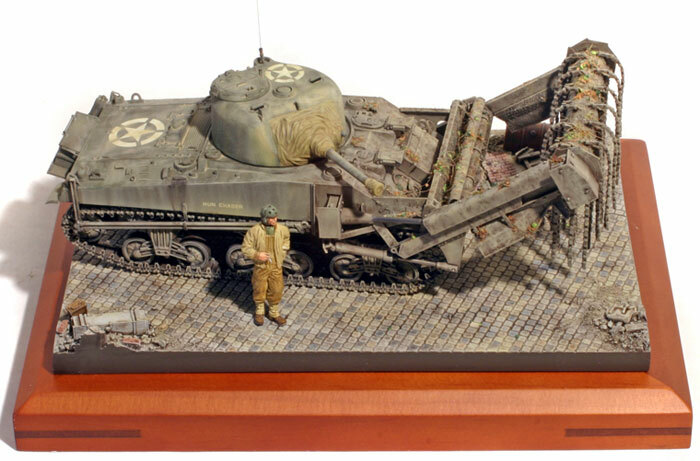 It is especially suitable for projects that would be large and tedious in 1/35th scale. A good example is the British Crab Flail tank. I have had conversion sets sitting in the basement for years, but the appearance of Tim Perry's 1/48th multi-media kit prompted me to revive this project. Tim runs "Fighting 48" (www.fighting48th.com) which specializes in 1/48th scale conversions with an accent towards British subjects. I got his earlier Universal Carrier track set to replace the wretched Tamiya example, and it is a wonder to behold. Tim uses CAD-CAM to generate a master, then casts the master using conventional resin techniques. In addition, he often offers photo-etch as part of the product. 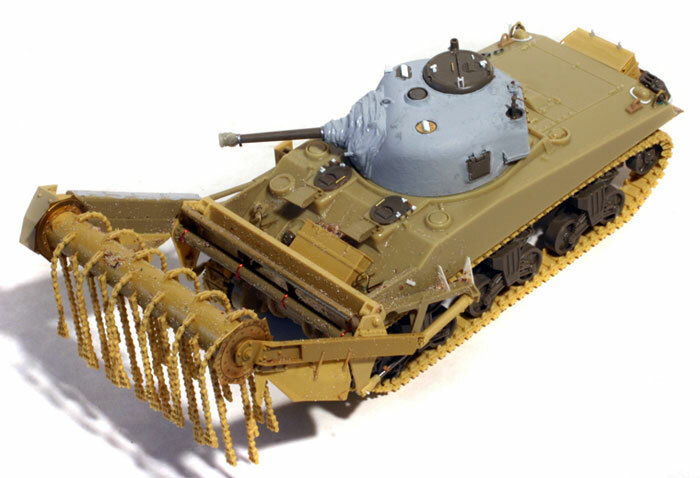 In the case of the Crab Flail, Tim had earlier done a M4A4 (Sherman V) conversion for the Tamiya Shermans, plus an appropriate track set. He bundles these two sets together with the Crab Flail set for 56 pounds US$112) which is not cheap, but you pay for quality. The kit is really quite remarkable. The parts are far more reminiscent of plastic kits in that they are not based on hand-made scratch-built parts like most resin kits, but from computer generated drawings. The results are exquisite masters. Tim's photo etch is equally good and he supplies a generous amount of spares. The kit is actually oriented more for the Crab Mk. II with its more elaborate stowage and fittings. I wanted to do one of the first US Army Crabs which was in the early Mk. I configuration so a fair amount of Tim's parts went to my parts bin. 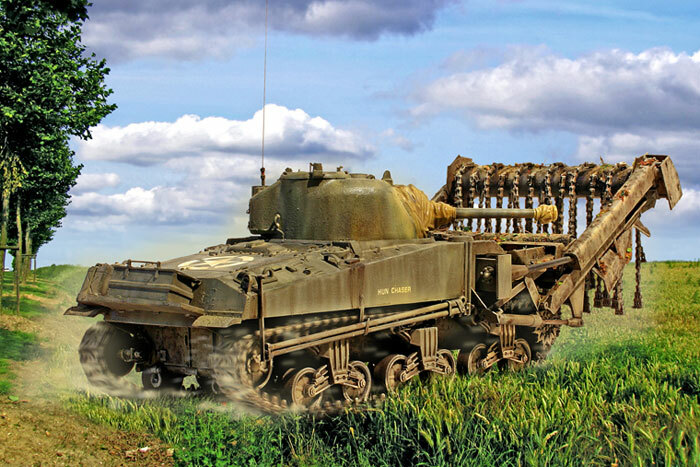 Although the US Army ordered fifty Crab Flails in February 1944 for the D-Day landings, the British army had problems providing enough for their own units and so a handful only began to trickle in to US units in July 1944. A Crab platoon was formed in the 2nd Armored Division, and during operations around St. Lo in mid-July 1944 these tanks were seconded to the 747th Tank Battalion, supporting the 29th Division. 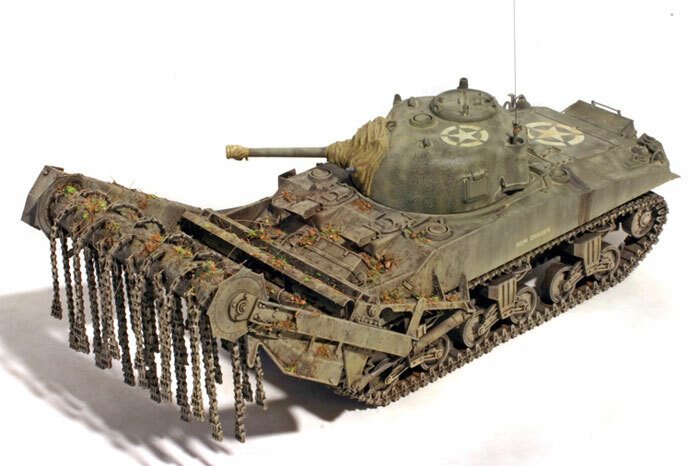 I did one of these tanks, named "Hun Chaser"
The Fighting 48th kit requires a Tamiya Sherman donor kit, with the M4A1 being the best choice as the many left-overs can then reinforce the Sherman 1/48 spares bin. The needed pieces are mainly the turret and running gear. The Fighting 48th kit provides the hull, track, and Crab bits. Overall, the fit of the kit is excellent, and the Fighting 48th instructions are a benchmark of top-of-the-line aftermarket instructions combining excellent illustrations and notes. However, modelers should be aware that this is a craftman's kit that takes a lot more work than a typical plastic kit. I found it very time-consuming to build as I frequently resorted to 5-minute epoxy to ensure solid construction. I made some additions on my model including an epoxy putty dust cover oer the mantlet and a bit of kit on the right hand side peculiar to the early Crab Mk. I. The figure is from the excellent Dartmoor series (thanks John Rauscher! ), the markings are from Archer (thanks Woody Vondracek!) and the base is from Verlinden (thank you credit card!). This was a complex but fun project, bolstered by the superb quality of the kit.